It's time to stop guessing which advertising investments are delivering inbound phone calls and customer interactions and let KeyMetric Call Tracking quickly and easily show you the exact traffic sources, ad campaigns, PPC keywords and media buys for every visitor engagement and customer acquisition on your website and within your mobile Apps. In just minutes you will gain access to intelligent, real-time data proving which marketing campaigns, sources and content are generating leads and sales; empowering you to re-invest only in those campaigns and sources that are generating positive ROI.
" Thousands of International Fortune 500 companies, national brands, ad agencies & small & medium sized business locations rely on KeyMetric every day... "
The entire planet is going mobile, and KeyMetric "Touch-2-Call" technology allows you to track phone calls made from mobile phones and digital devices, such as tablets and laptops, without the need for tracking numbers or per-minute fees. Your existing business phone number will continue to display on your website for visitors on mobile phones and tablets while you still capture critical lead data. Visitors on desktops and other digital devices will see a dynamically inserted tracking phone number.
" +70% of all website visits result in an phone call. 65% of those are made from a mobile phone or device... "
For businesses located in countries where toll-free and/ or local phone numbers come at a very high cost, businesses can now benefit from intelligent call tracking and analytics without blowing the budget. 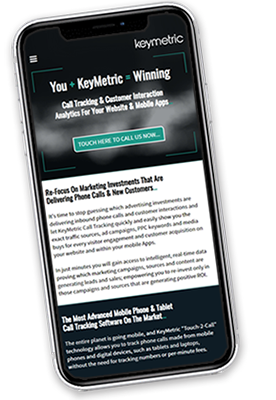 In fact, KeyMetric Touch-2-Call has helped businesses around the world save hundreds of dollars every month on their call tracking. With KeyMetric you can easily track unlimited online and offline customers' engagements from unlimited campaigns, ad sources, PPC keywords and media placements. No other service on the market seamlessly combines phone call and engagement tracking without requiring complicated integration between multiple third-party solutions.